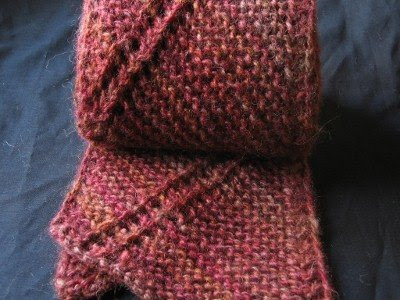 The yarn used for this project was handspun from Spunky Eclectic Galaxy BFL roving in the Mars colourway. 4 oz of fibre produced 200 metres of aran weight yarn. The depth of colour in this yarn is amazing. If you haven’t tried Amy’s Galaxy range yet, you’re definitely missing out! The following pattern can be downloaded in PDF form (including charts) from Ravelry. Yarn: 200 metres (220 yards) of aran weight yarn. I had about 15cm (6″) left over. pm – place marker – placing a marker at the point specified in the pattern will make your life easier. Every time you reach the marker on right side rows, you’ll be at the point where you [yo, k2tog] twice. The marker will move along automatically and will eliminate the need to count the knit stitches. Loosely cast on 28 stitches. 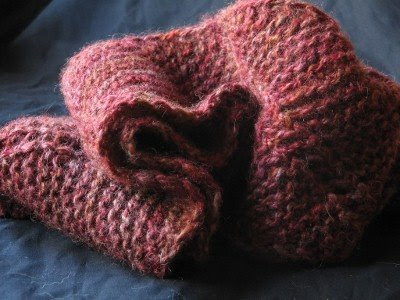 Repeat 50 rows of pattern seven times or until yarn runs out, ending with a wrong side row. Cast off loosely. I recommend Elizabeth Zimmermann’s sewn cast off. Weave in ends and block. Blocking will open up the yarn overs and add drape to the finished scarf. Well worth the effort! You are currently browsing the Southern Cross Fibre blog archives for May, 2008.